I graduated in music at Oxford University in 1980, and stayed on to produce a doctoral thesis on the music of Elliott Carter . This was submitted and accepted in 1986, and subsequently published in the USA by Garland Press Inc. I taught for various Oxford colleges from 1983 to 1986, and held a temporary lectureship at the University of Reading, 1984-85. I specialised in music theory and analysis, presenting courses in analytical method, publishing articles and reviews on twentieth century music, and running the Oxford University seminar on musical analysis for a couple of terms. My first professional appearance as a guitarist was at the age of 15, with the North-West based contemporary music ensemble Normedia. I studied guitar with Gordon Crosskey and later with Carlos Bonell, and achieved honours in the ARCM performers' examination in 1981. In the 1980s I performed a great deal as a solo guitarist and ensemble player, in particular in contemporary music ensembles. I enjoyed a long association with Music Projects London, played with the Koenig Ensemble on occasion and was a regular member of the Almeida Festival Ensemble. I ran my own ensemble Mandala, consisting of guitar, violin/viola, flutes(piccolo to bass) and keyboard. Both as a soloist and with these groups I participated in many world, European and UK premiers. 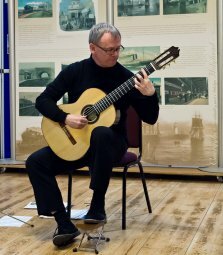 I am particularly proud to have been the dedicatee and first performer of Bayan Northcott's extroardinary Fantasia for guitar, one of the most striking contributions to the instruments repertoire in the past half-century. It is published by Stainer and Bell, and has been recorded by David Starobin on his Bridge label. If you are at all interested in the guitar's new repertoire, you should check it out. Over the paste few years I've kept up a schedule of four or five concerts per year. Some of these, along with other recordings, are available on SoundCloud . They include solo recitals, and other duo performances with flute, cello and harpsichord, with music ranging from the Baroque to 21st century. I've composed since my schooldays. My list of compositions not surprisingly includes music for guitar solo, duet and chamber music, but there are also many works for other instrumental combinations. Many arrangements are now available from Fedora Music UK.